I’m not a 切手収集家 (stamp collector) but sometimes the post office offers 切手 (postage stamps) that I can’t refuse…so I have a few collectors’ sheets of stamps from the Japan Post Office. 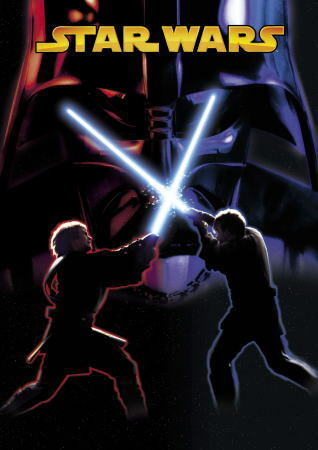 One of them is the 「スター・ウォーズ切手」 (“Star Wars” stamps). 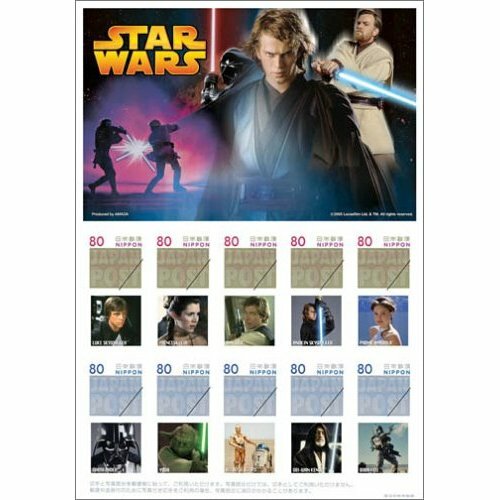 These stamps came in a nice, hard-cover protective binder illustrated with Star Wars artwork. 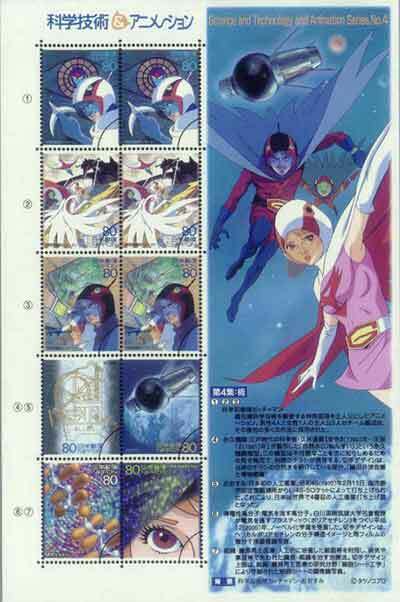 Another series of stamps that the post office in Japan offered a few years ago was what they called 「科学技術とアニメ・ヒーロー・ヒロインシリーズ」 (“Science & Technology and Anime Heros & Heroines Series“)…which included such anime as 「鉄腕アトム」 (“Astro Boy“) and 「名探偵コナン」 (“Detective Conan“)…but the one I got was Series Four: 「科学忍者隊ガッチャマン」 (“Science Ninjas: Gacchaman” (known overseas as: “Battle Of The Planets“)). I used to watch this cartoon in America when I was a kid. Awesome! I think I will write all my friends postcards with great stamps from Tokyo, they’ll love it!!! The stamps I show here are collectors stamps. Regular stamps are not as fancy. (Probably the same in every country). maybe I could try and find the KISS stamps for you if you want me to? I love the stamps you gave me years ago from Japan. BTW, I also love Japanese art. Don’t go out of your way…but if you happen upon the KISS postage stamps, I’d appreciate it. Which I have ^_^ of both countries actually – the country where I’m from and the country where I’m currently at. *stars in my eyes* when I looked at your Battle of the Planet stamps .. *sigh*anyway lucky you to be able to collect those. Whenever I received any letters from my friends in Japan, I always love looking at the stamps that come on the envelopes, some of them cultural, some of them are manga / anime characters / hello kitty (my favorites) and so much more ..all i can say Japan produces some of the most beautiful artwork of stamps in this part of Asia. You should ask your friends to send you some Japanese stamps. Maybe I should, I’ll ask her first … i could ask her to keep an eye out for Battle of the planet collection. You should send her some stamps from your country, too. Nice. 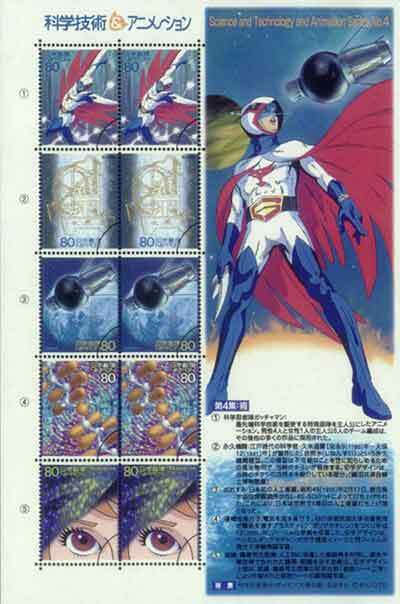 If I was living in Japan then, I totally wold have bought those Gatchaman stamps. Thanks for posting the pics. Anytime you visit the post office, you should check the flyers there to see what stamps they’re offering. That’s how I found these. I still cannot believe that the post office doesn’t buy a car and make a mail car on the shinkansen to do same-day deliveries. It seems they could make a lot of money doing that. You can have mail delivered by the next day anywhere domestically in Japan…and if you live in a major city (Tokyo, Osaka, Nagoya, Sapporo or Fukuoka), the post office will deliver mail within the same city by 5:00 PM the same day (if you mail it by noon). I just found out that there are KISS postage stamps in the U.S.! If I lived in America, I’d definitely buy these!